Large pores on face are more likely to be seen on the T Zone – this is the area most likely to be oily and is called the T zone because diagrammatically, it can be drawn as a T shape, across the forehead above the eyebrows forming the top of the T, down the nose and either side of it and extending down to the chin forming the upright of the letter T.
Pores are hair follicles and the openings where sweat can be excreted from the body. Oil or sebum which is produced in the skin is also excreted through the pores to lubricate and hydrate our skin. Oil production is governed by a number of factors and an overproduction of hormone, especially during our teenage years can lead to a corresponding over-production of oil in our skin. Pores appear large for a number of reasons, some of them genetic – in other words, you could be genetically predisposed to having large pores or, as we say ‘it runs in the family’. Several factors cause pores to appear larger and whilst there is no way to permanently reduce the size of large pores on the face, it is possible to do a lot to improve their appearance and get a smooth complexion once again. 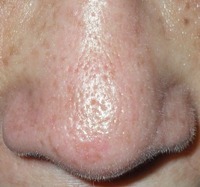 Blackheads can make pores look larger and more prominent. Caused by plugs of excess oil combined with dead skin cells and other impurities, blackheads clog up the pores. Follow the skin care advice on this site on how to get rid of blackheads and how to prevent them from recurring (take a look at the site index page to get a listing of all the pages, articles, tips and advice on the site). You need to get yourself a simple three step skin care regime, cleanse, exfoliate and moisturise with a moisturizer that will not clog pores (look for the words non-comodogenic on the labelling) to prevent future blackheads. You will find these two articles particularly helpful, “What are Blackheads” and “What Causes Blackheads”. In addition, you can do several things to help your skin. Reduce the amount of sun exposure your face gets by making sure to use a moisturizer with an appropriate sun protection factor (spf) during the daytime. Sun damage makes pores look more prominent. Make sure that you always remove makeup at night so that your pores are clean and clear when you go to bed – this will help to stop them becoming clogged and make them look less visible as clean pores look smaller and tighter. Many products are available that are branded as having a pore minimizer action and these are great to incorporate into your normal skincare routine. There is also a lot you can do cosmetically to improve the appearance of your skin. Use of a mattifier will help to prevent oil from breaking through your makeup. A primer put on under your foundation (if you use it), will help to ensure that your foundation looks smooth on the surface of your skin and does not sink into your pores. If large pores are a problem for you, you may prefer to avoid using a makeup foundation on those areas and just use a blotting powder instead. What the blotting powder does is diffuse light making your skin look smoother and more matt in appearance. You can also use either a gel or cream which is especially created for application to problem areas where pores appear large. The creams are available as tinted creams and will definitely improve the appearance of large pores. Apply this type of cream as you would foundation cream, but only to the areas where you need it. When it is ‘set’ or dried, you apply loose powder very lightly. Look for these products branded as pore perfecting creams and gels. Whilst you it is not possible to get rid of large pores on face you can make them appear much smaller, tighter and less visible if you follow the simple skin care routines outlined on this site and always take care to cleanse, exfoliate and moisturize with appropriate products for your skin type.